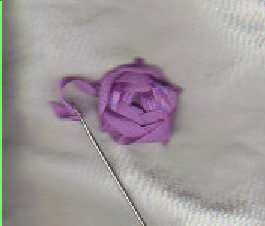 There are several ways to make ribbon embroidery roses, and we have made a twisted rose in a previous blog. 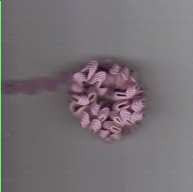 There are also more ribbon embroidery roses that we make with ribbon or embroidery thread. One of these is the accordion folded rose, and it is the first of the ribbon embroidery roses that really caught my attention. It is made with two 9 inch lengths of ribbon. Place the ribbons at right angles, and accordion fold the entire ribbon. Then pull one end slowly, and it makes a rose. It really works! This is the rose shown on the left above. Once you have the rose or roses made for your project, use a chenille or large needle and thread the open end. Punch it through your fabric and tack the roses into place. These flowers are really worth learning, since they are useful for so many different crafts. 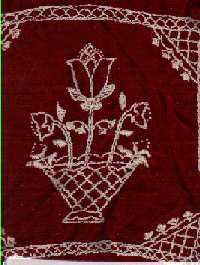 The other rose we like is the spiderweb ribbon embroidery rose. It can be made with either ribbon or embroidery thread. This is the one on the right above. 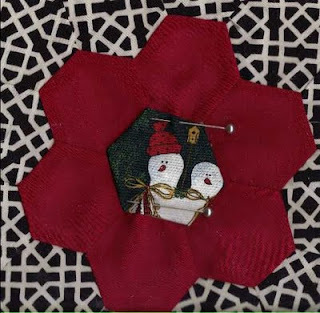 This ribbon embroidery flower starts with five spokes from a center. Then weave the ribbon in and out of the five spokes. Weave loosely for silk ribbon and yours will look just like mine. Needlework crafts are our favorites, and we like to share these fun and easy tips and projects. You still have time to make some crafts for Christmas! Ribbon embroidery roses are great fun, and there are several different kinds. I like the look of the twisted rose, and it works well on crafts items, not just ribbon embroidery. We use ribbon embroidery flowers for many of our crafts projects, and they are easy to make and have a unique look. 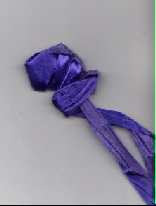 If you want to make a ribbon embroidery twisted rose, it takes two ribbons in about a 9 inch length, or 18 inches total. This will work for just about any ribbon that is less than an inch wide. 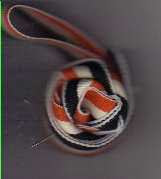 We have used grosgrain with stripes here so you can see the crafting process. Place the ribbons together with right side facing out. Twist the ribbons together by holding both ends, until all areas are twisted. Bring your hands together and the ribbon will twist around itself. Begin rolling the ribbons from the far end, and you will make a twisted rose. Once you do a few of these, you will love the simplicity of making the ribbon embroidery twisted rose. See you next time with new needlework crafts. Thanks for stopping by. Yo-yo circles are great for so many uses, and we have been making some fun Christmas ornaments and thought we would share this one with you. This Christmas ornament takes three yoyo circles, and we do not use the glue gun at our house. 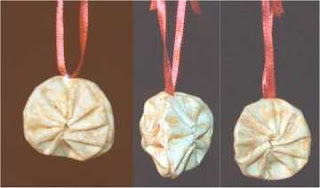 We sew these three yo-yos at the bottom and at the top only, and add a ribbon for the hanger. We hope you have lots of fun with these. Ribbon embroidery is a fascinating needlework crafts project, and there are unusual stitches and ways to make flowers. Most of the flowers are made with ribbon, but I have made some rickrack flowers recently that work well with the ribbon flowers. You probably have some rickrack around the house from years ago. Typical of many of our needlework crafts, we use what we have available for frugal living crafting. Here is a rickrack chrysanthemum made with running stitch on every other point of the rickrack. Once the hand stitching is done, just pull the thread to gather the flower. Make a rickrack chrysanthemum with running stitch on every point. Fun to learn and easy to make. Use these rickrack flowers on your small gifts, or make designs on fabric with several flowers. We will have instructions for other ribbon embroidery flowers within the next couple of weeks. If you love the feel of fabrics and fabric crafts, rayon velvet is right up there at the lap of luxury. It has the most wonderful feel, and is not stiff like velveteen. Many people would not expect that embroidery would work on rayon velvet, but I have seen and made a few extraordinary pieces. 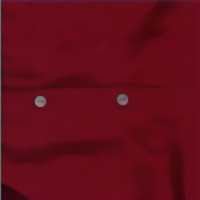 Rayon velvet crafts work best for large items like tablecloths or lap robes. It takes a large needle and twine or candlewicking thread to make the stitches show up well, but it works quickly and is a unique kind of needlework crafts. You can make a large design really stand out, and it works with unusual stitches, too. Stitches that are mostly top surface work best. Every cat needs a bed warmer for cold weather if it is an outdoor cat. Your cat has probably already made a cozy spot to stay out of the wind and snow, but when the weather gets about zero, even that is not enough. Your cat can have a bed warmer just like a heating pad with very little effort on your part. It takes a sock and some rice, and maybe a couple of seams on your sewing machine. Over time, the rice tends to break up and can come through a loose weave, so choose a sock with a tight weave or make a bag to fit inside the sock. 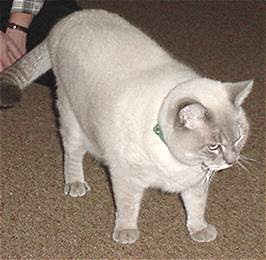 Your cat can be a fat cat with a bed warmer or heater. Just put the rice in the sock and sew it closed. We use about a cup of uncooked rice. When you are ready to warm the bed warmer, put it in the microwave for 30 seconds or so. Wrap it in a towel and put it in the cat's bed, especially if it stays outside in the winter. Your cat will thank you for your cleverness and crafting ability. Make a pillow from a man's shirt--repurpose a shirt that is too small or one Hubby does not like. Recycle and re-use to make great crafts projects. The point here is to make a fun and easy crafts pillow project without having to make buttonholes or sew on buttons. You will be using both the front and back of the shirt--and one side will be the front of the pillow, and the other will be the back. See how much fabric you have to work with. Standard pillow sizes are 12 x 12, 14 x 14 and 16 x 16 inches. Lay the shirt out flat and measure. If the shirt is large, you may be able to get the largest size--which would be about 18 x 18 cut squares, since you need to add an inch all the way around for the seams. Once you have the pillow squares cut, you may want to decorate either side you choose to have for the front, before sewing around the edges. When ready, put front sides together and sew around the squares with about 5/8 inch seam allowance. These pillows are so neat, because you can sew all the way around the outside and then just unbutton the buttons and turn the pillow. Stuff with a pillow form or with a product of your choice. Sometimes I make a pillow form from two muslin squares, and a little smaller than the pillow. Sew around the muslin squares with about 1/2 inch seam, and leave an opening to turn. Turn the muslin pillow form and stuff it with old pantyhose or shredded foam, and whip the opening closed. This crafts sewing project won't take long, won't cost much, and will add to your home decor. Your friends may want one, too. Have fun with needlework crafts! 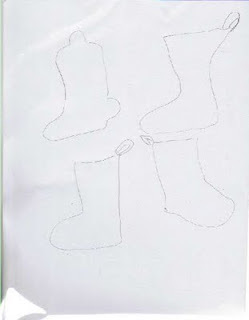 Christmas stockings are always fun, but most of us think of one large stocking for each person in the family. A Christmas tree with mini stocking ornaments is really a pretty decoration for your home, and you can make each of the stockings different. We always have some denim mini stockings here, and some cowboy boots, since we live in Texas. 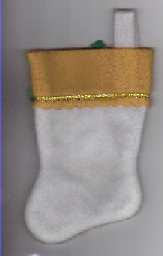 You can sew mini stockings by hand or with the sewing machine, since there is so little sewing. We recommend making mini stockings in one of two sizes--either three-inch size for a little Christmas tree or six-inch size for a large tree. Here are some outlines you might use. Enlarge one to the size you want and add about 1/4 inch to sew all around. Cut two of the shape from fleece or felt, since these fabrics do not fray and are easiest to sew. Sew around the edge by hand or by machine, and you can sew right sides together and turn or wrong sides together and don't turn--just leave the rough edge. You may want to put a top around the mini stocking ornament, too. We have some undecorated examples in an article that gives more detail. Ask if you have questions. We are delighted to share. Do you like to do quilting with specialized cut-out pictures or patterns? We often do fussy cuts in quilting, particularly on pillows or just a center design for a quilt block. Fussy cuts also are used for apron pockets, and other places you want to have a perfect match. If you like a little more challenging work in quilting or crafts, you might want to try to do some fussy cuts. You can figure out how to do this by trial and error, but don't forget to allow for the edge to turn under. We always leave 1/4 inch. We like to work from the center for the fussy cut, and in this one, we centered the nose of the large snowman. You can see how to measure and how to apply the shape to a flower garden quilt block. 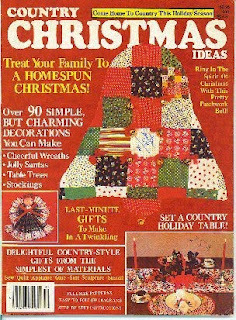 This is a fun needlework crafting project that lets you be creative and make something unique. Of course if you have questions, just ask. This should be fun! Needlework crafts have been a favorite pasttime for children and adults, and some crafters do not get started early like I did. It is never too late to learn needlework if you have an interest, and there are so many crafts to keep busy with, it is sometimes difficult to choose. Maybe you don't want to choose--and you can have several. Quilting has been one of my favorite needlework mainstays, but cross-stitch, sewing, crochet, macrame, ribbon embroidery and any creative off-shoots of these are also great fun. I learned knitting at a very young age, but it is not one of my favorites. You can be a needlework crafter without much expense, particularly if you try small projects first and are resourceful in finding supplies online or at thrift stores. There is no better time than now to resume needlework you already like or to start a new project. Fall is here and there will be more time spent indoors, and Christmas crafts are ideal to work on now. See you in a day or so! Hope you get out the needlework crafts now.